Must be on a maximum 6-foot leash. Not allowed on beach or in the lake. 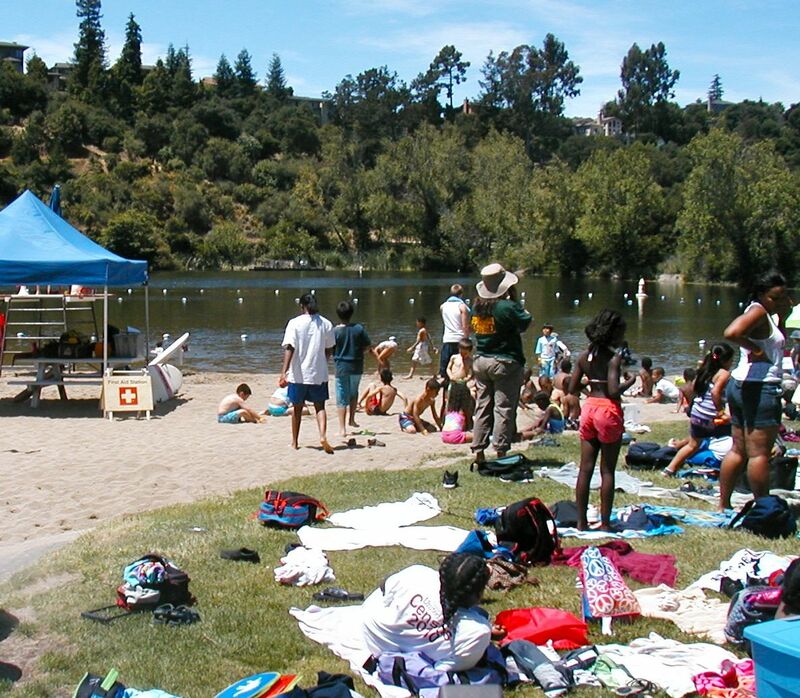 Tucked between the intersection of Highways 24 and 13 in Oakland, you'll find Temescal Regional Recreation Area, one of East Bay Regional Park's first parks. 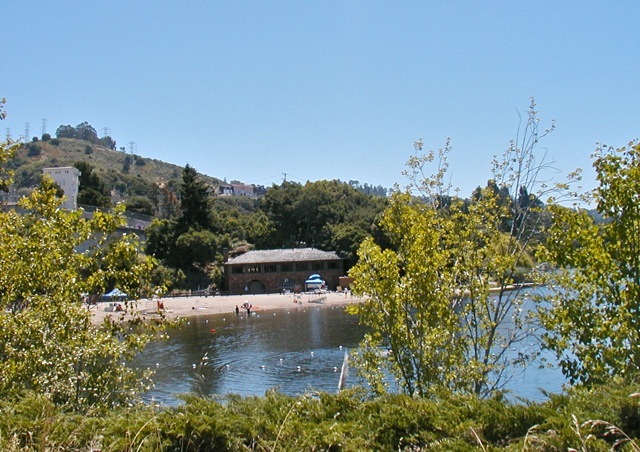 Don't let its proximity to these freeways deter you from a visit for it offers a convenient way to swim at the beach, fish from an accessible pier and enjoy a lakeside picnic. A grassy area immediately adjacent to the beach, is firm enough to roll over in a wheelchair, and gives one the sense that you're on the beach without the hassle of going across the sand. Accessible changing rooms are nearby. If the beach isn't your thing, there's a lovely .5 mile paved trail that runs along the east shore; with places to picnic along the shore and an accessible fishing pier that's good for viewing waterfowl . 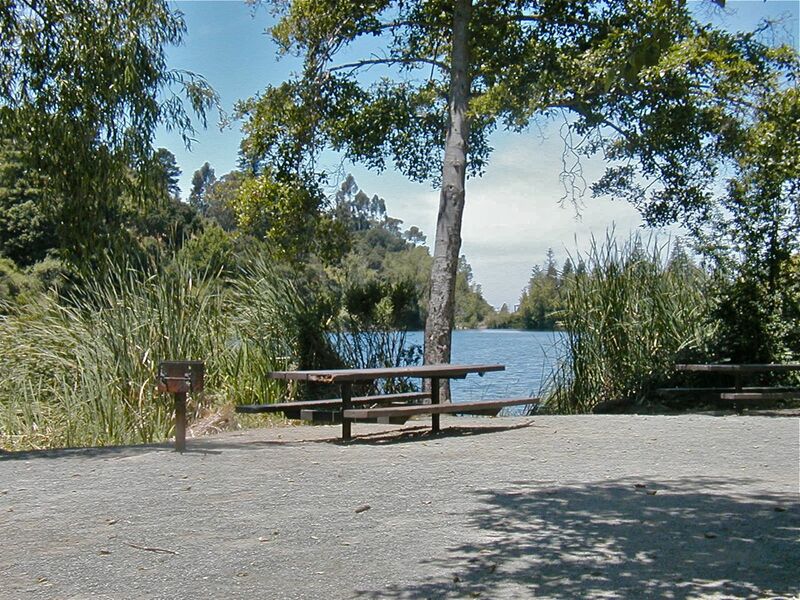 Understandably, the park can be fairly busy during summer, especially on weekends, so don't go expecting a quiet retreat, but plan to be surprised, as I was, to find this sweet, urban oasis in Oakland. Trail Overview: On this short, yet pleasant paved trail that travels the perimeter of the eastern shore, you pass a native plant area, 10 acres of turf, and mature live oak, willow and laurel trees. An elevated trail that runs parallel to it and close to Hwy 24, offers a birds-eye view of the park. The stretch on the western shore, while more secluded, has access challenges including a steep approach at it's south end and a set of stairs near the parking at the north end. It hugs a shaded hillside as it follows close to the water making it significantly cooler than the east shore.